The microstructure of frozen soils implies the totality of microstructural and microtextural features inherited from the unfrozen materials as well as those acquired during freezing and in the frozen state. The concept of microstructure includes the size, shape, pattern of surface and the quantitative proportions of elements that compose the frozen soil and the nature of their relationships. Microstructure is defined as the totality of attributes that characterize the relative arrangement and distribution of elements of the frozen soils in space. The elements of the frozen soil microstructure include primary mineral grains, particles, their aggregates that compose the mineral skeleton, ice crystals, unfrozen water, air inclusions and foreign admixtures of a size, as a rule, of less than 1 mm. Fig. 7.12. Lens-like laminated cryogenic texture of the syngenetically frozen silty clays (photo G.I. Dubikov). are also massive, porphyry, ring-like, laminated, and latticed cryogenic microstructures. Their principal types are, in general, similar to the well-studied cryogenic macrotextures. However, unlike the latter, microstructures are to a greater extent curved, discontinuous and inconsistent. The frozen soil microstructure is largely heterogeneous. Generally, the formation of cryogenic microstructure is controlled by the conditions of accumulation and freezing. In general, two principal genetic types of frozen soils are distinguished: epigenetic and syngenetic. The microstructure of epigenetically frozen soils reflects their microstructural and microtextural peculiarities acquired before freezing. These are represented in the degree of aggregation, compactness of mineral skeleton and the inherited nature of ice segregation. Thus, for the silty clay icemarine deposits of the Salekhard suite which have undergone a stage of lithification before freezing, a matrix-like microstructure of the mineral skeleton is typical, which is similar to the nonfrozen deposits. Distinctive features of the frozen soil are demonstrated by the morphology of ice-cement and ice inclusions, as well as by the microstructure of the adjacent zone (Fig. 7.13a). Fig. 7.13. Microstructure of epigenetically (a) and syngenetically (b) frozen clay soils: 1 - ice; 2 - mineral particles. specific nature with higher ice content, predominance of basal ice-cement and the occurrence of a loose organo-mineral skeleton (Fig. 7.13b). Such a microstructure, according to V.V. Rogov, is typical of the syngenetically frozen deposits of the ice complex, which are characterized by the poorly aggregated loose organo-mineral skeleton divided by the basal ice-cement into aggregates sized 0.2-0.3 x 0.5-2 mm. Apart from ice-cement there are ice lenses and bands 0.1-0.2 mm thick with crystal axes oriented almost vertically. The microstructure and microtexture of frozen soils are closely associated with grain size (Fig. 7.14). Rudaceous and sandy materials which are non-cohesive, have a massive cryogenic texture. Their mineral skeleton does not experience any change at freezing. The contact between structural elements is of a point type. Irrespective of the freezing regime, water is retained in pores or is partially pushed out. The type of ice-cement varies from needles and cuffs to basal. Fig. 7.14. 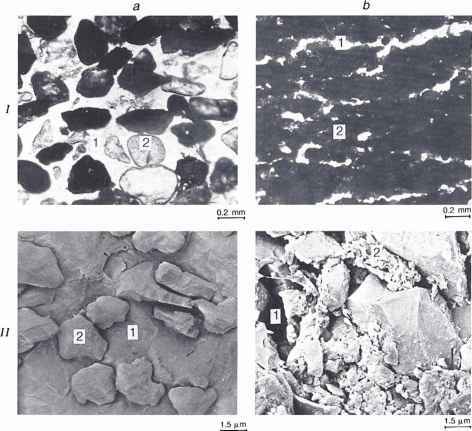 Microstructure of frozen soils of different grain size according to data from optical (/) and electron microscopy (II): a - sand; b - silty-clay; 1 - ice; 2 - mineral particles. straight edges, with their main optic axes being, as a rule, oriented perpendicular to the longitudinal extension of the schlieren. Fig. 7.15. 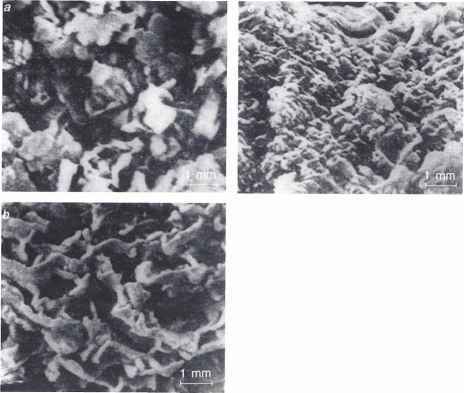 Microstructure of frozen kaolinite (a), unfrozen montmorillonite (b) and frozen montmorillonite (c) clays. kaolinite clays. Favourable conditions for moisture migration in the kaolinite clays promotes ice segregation with ice microschlieren varying in thickness from a hundredth of a millimetre upwards. 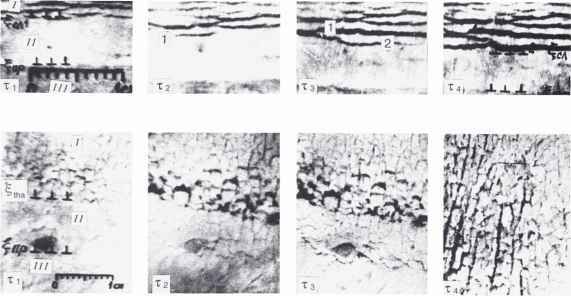 A distinctive feature of the frozen montmorillonite clay microstructure is a cellular microtexture. The microstructure of the mineral blocks and the size of ice schlieren is determined by freezing conditions. In general, the blocks typically have a compact structure of aggregates and an insignificant amount of ice-cement, which is explained by the local contraction of the mineral skeleton resulting from moisture migration in all directions from the centre to the bordering ice framework. 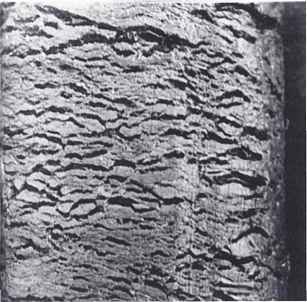 A characteristic feature of hydromica clay microstructure is slit-like pores of irregular shape conditioned by the morphology of particles and aggregates having a leaf-like form of skeleton with slightly curved surfaces and tortuous boundaries. The microstructure of frozen fine-grained soils reflects the inherited nature of the microtexture existing before freezing. Among the inherited features are their structureless nature, laminated with availability of aggregates, etc. Thus, the undisturbed sample of a silty-clay from a seasonally thawing layer showed: compact soil aggregates; ice inclusions of porphyroid kind with part of the pores not filled with ice; and 'ice-covered sites' were practically absent. Microstructure of a disturbed silty-clay sample was characterized by a uniform distribution of the sandy-silty fraction, by the circular, isometric, less compact aggregates, by the absence of purely clay formations and by big pores as well as by the presence of both pore ice-cement and ice microschlieren. Restructuring of the initial microstructure is much conditioned by freezing regime. As a rule, with higher rate of freezing, the more uniform is the distribution and correlation of structural elements; their average size is reduced; ice microschlieren become less thick and more frequent. Freezing of the soil in conditions of moisture inflow leads to a poorly aggregated mineral skeleton with small loose aggregates, a predominance of basal ice-cement and the presence of frequent ice microschlieren. In the absence of moisture seepage a compact skeleton forms having big aggregates with porous ice-cement and rare ice microschlieren. With a certain regime of cyclic freezing in the clay soil circular microstructures are formed, resulting from differentiation of the materials that comprise the soils (16).